Whilst driving, I rely upon Google Maps to provide me with turn-by-turn directions to my intended location. Google Maps provides me with appropriate route options, and time to location. With that business listed on Google My Business it also knows the opening hours for the business and whether I will be able to arrive on-time before it closes. Over the past five years we’ve seen a dramatic shift in how consumers search for local businesses as well as the role which online reviews play in the consumer’s research and decision-making process. 7 out of 10 consumers will leave a review for a business if asked. There are many local business listings, map listings and review sites for your business to be submitted, to manage and monitor. Business owners need to be aware of ensuring that their correct current business contact information is listed, and that duplicates have been removed. Many business owners are not aware of a past import of Sensis Yellow or White Page data included as their business listing information on some online directory services, which subsequently form the basis of business listings for a map provider that contain old and outdated data, adding further confusion to the consumers trying to identify, connect and locate your business. Not being listed as a business on a mapping service provider, creates confusion and frustration for the consumer experience, and opens the opportunity for discovery of alternative and competing services that appear based on location and keywords/brand name typed into the search query. This is creating a missed opportunity for the business to drive (literally) traffic to their business. Listing your business on map services also opens up access to many of the popular online review channels either directly on the platform such as Google My Business reviews, or third-party consumer content driven recommendation engines such as Yelp!, FourSquare, TripAdvisor and also Facebook Reviews. Managing and monitoring review sites is an important activity for businesses these days to stave off negative SEO attacks by competitors, disgruntled ex-employees, or consumers wishing to rant about a negative experience with your brand. As we’ve seen from the research data, negative reviews can influence the buying decisions of future consumers who look for trust signals about your business to determine whether to engage. If you need assistance in setting-up, managing, monitoring, and addressing negative reputation management as well as actually building positive reviews that you can leverage then let us know! We also perform a reputation management monitoring process for your brand when you are an SEO client of Toby Creative, keeping an active eye online amongst news, blogs and social media channels for mentions of your brand. Are you a Perth business that needs local SEO optimisation for your website? 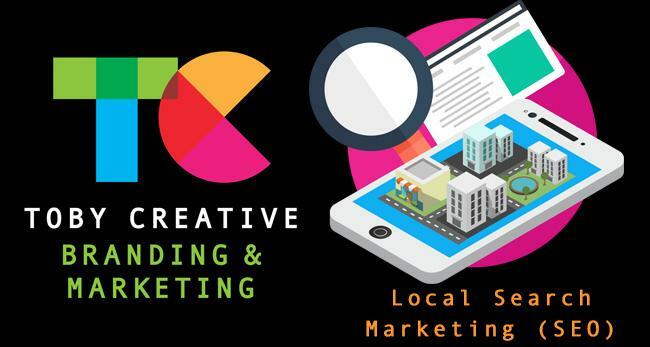 Toby Creative – Branding & Marketing, provide a comprehensive range of business SEO services including business map listing on Google Maps, Bing Places and Apple Maps. Start with a free no-obligation consultation at your location, we’ll review your current online presence and discuss a suitable plan to match your business and your budget. Give Toby Creative a call today on (08) 9386 3444 or email info@tobycreative.com.au. Sign-up now and receive 50% OFF your first month of Toby Creative Google Adwords Management during September. No lock-in contracts! Optimisation and support from our Google Adwords specialist team. Local Perth Account Manager. 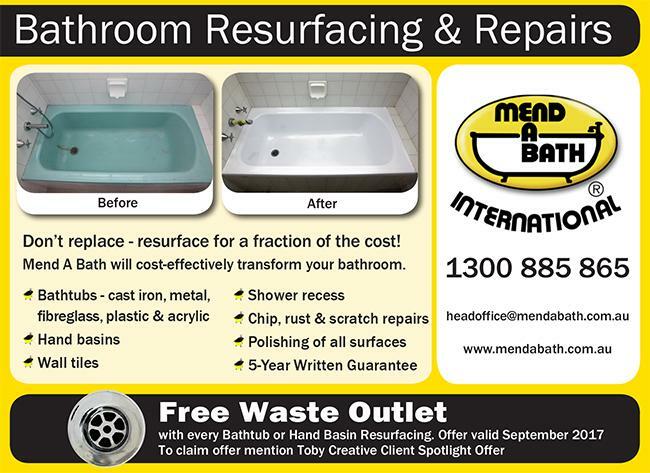 Mend A Bath International – Australia provide quality, professional, domestic and commercial bathroom resurfacing services in Perth, Western Australia. Special Offer: Save $66 with a FREE false waste included with any bathtub or hand basin resurface project during September 2017 by referring to this Toby Creative Client Spotlight Offer. The false waste is an elegant finishing touch to your bathtub resurface with either polished stainless steel or chrome plated, depending on the look you are after to match your bathroom decor. Save time and money as Mend A Bath are both quick and convenient, resurfacing can be achieved in under three hours and you can then use the bathtub twenty-four hours later. Mend A Bath, don’t just do baths! Providing a five-year written guarantee on both product and workmanship (exclusions apply). Get a Free Quote today.